- Pre-booking is a must! Hurry up and book your spot as only limited seats are available. -Primer; what is it & why should it be used? All you need is your daily makeup set and yourself, waiting for you! Dina is certified from “Elite Pro – Spain”, “Xtreme Lashes by Musseli – Canada” and “Lab Academy – Lebanon”. Initially working with a team of artists to help clients get ready for their special events. In 2012 the salon moved to larger premises with significant expanding capacity allowing to offer a larger range of treatments as well as offering makeup courses. Dina continuously updates her knowledge of techniques and has attended workshops with Roshar, Bassam Fattouh and Fady Kattaya. Ensuring the team at the salon also have continued professional development and the best training is a priority for enabling the makeup salon to maintain the highest standards of service for the clients. 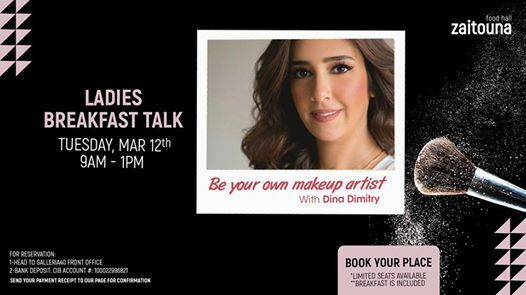 Dina has worked with celebrities such as: “Yousra, Yasmine Abdel Aziz, Nour, Emy Samir Ghanem, Donia Samir Ghanem, Mona Zaki and Mai Selim”.